We’ve been hearing about the benefits of going green for years, as more and more architects and contractors come to us in search of eco-friendly solutions for their buildings. As more and more end users seek sustainable and, ultimately, LEED certified buildings, our customers have started to ask us more about the details - what does it mean to be LEED certified, and what’s the real benefit? LEED (Leadership in Energy and Environmental Design) is a rating system developed by the U.S. Green Building Council (USGBC). The LEED system is recognized worldwide as the standard for sustainability and efficiency. How does a building become LEED certified? First, register your project with the USGBC (registration fee required). Then, submit your LEED certification application (review fee required). Next, Green Business Certification Inc. (GBCI) review your project and application. Lastly, you’ll receive notification of whether your project earned LEED certification. The application reviews credits accumulated throughout the building process. Credits can be earned in many ways, from managing pollution during the construction process to using locally-sourced materials, among many, many others. Can older buildings become LEED certified? Yes, it is possible for existing buildings to become LEED certified. This can happen in one of several ways. If the existing building is undergoing a major renovation, it could qualify for LEED certification via the New Construction or Commercial Interiors processes just as a new building would. Or, an existing building could become certified through the LEED for Existing Buildings: Operations & Maintenance (O+M) rating system. This process involves changes in the way the building operates to ensure it is running efficiently that will be inspected and reviewed to determine whether LEED certification can be achieved. In order to qualify for this certification, all construction must be completed three months prior to the application. Can products and materials be LEED certified? The USGBC only certifies buildings and neighborhoods; products and materials themselves may not be LEED certified. Sustainable products and materials, however, can contribute toward credits for your application. Credit isn’t earned from using a specific product, but rather based on the product’s performance standards. To reiterate, the products themselves that meet the requirements stated above do not earn project points, but can help with credit achievement. 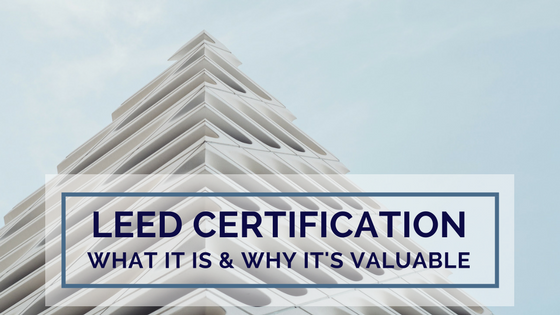 Why is LEED certification valuable? So, is there a real benefit to creating a building that’s LEED certified vs. one that’s simply green? Absolutely. First, the recognition is valuable. LEED certification is recognized across the globe as the symbol of sustainability and efficiency. Because of this, completing a LEED certified building boosts your reputation and sets you apart as a leader in the industry. This can lead to more business and bigger projects as people turn to you for your expertise in green building. LEED is also a symbol of quality, as every aspect of the building process and each material used is under scrutiny by the GBCI. Your building’s LEED certification doesn’t just show others that you’re committed to sustainability, but also that you’re trusted to create high-quality, long-lasting buildings. There may also be financial benefits to LEED certification. The energy and water efficiencies required in LEED-certified buildings lead to lower power and water bills for occupants. Additionally, the USGBC has found that LEED buildings often attract tenants and/or buyers more quickly than other buildings, offering a quicker return on investment than other properties. Depending on state regulations, builders and buyers may also qualify for tax credits and lower insurance premiums based on their building’s LEED certification. As earth-friendly building continues to grow in importance, it’s essential that architects and builders become familiar with the LEED certification process and the benefits it can provide to their businesses and end users. Learn more about LEED certification from the USGBC.